In 1998, Long Painting was involved in local history for an event known as the Historic Red Barn Renovation. Led by Long Painting Foreman Mike Johnson and his team, Long Painting was responsible for removing lead paint from the interior and exterior windows, priming and re-coating. Seventeen years later, Long Painting is back on the job power washing and cleaning the entire building. The building siding, signs and trim were recently spot primed and finished with two coats of Sherwin Williams 100% Acrylic paint. The project also requires the removal and replacement of six siding boards. The challenge facing Ruben Ohlenkamp (Foreman) and Justin Corgiat was to find six boards that matched the original siding milled all the way back in 1909. Using a damaged piece of siding as a model Ruben milled and beveled six boards in his personal wood shop to match the existing siding. The new boards were installed, primed, and painted perfectly to match the existing work. The south side of the roof was also expertly sealed and painted. 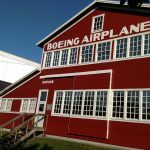 The Museum of Flight opened its first wing in the historic Red Barn on Boeing Field in 1983. The barn itself was built in 1909 and later donated to The Museum of Flight in 1975. The Red Barn is a great piece of local history and we are proud to have worked on it.The historic Red Barn looks as good as new thanks to the ingenuity and craftsmanship of Ruben and his wonderful Long Painting crew!